The boiler performs a critical role in supplying hot water and heat to your property regardless of whether it is an industrial, commercial or retail property. If you require boiler installation or maintenance services in your commercial property in Washington, PA, you will need expert commercial plumbing contractors like McVehil Plumbing, Heating & Cooling who understand the strenuous demands placed on your commercial boiler system. Installation of a new commercial boiler is not a simple task. You will need the help of experienced professionals to guarantee high-quality installation and safety since you are dealing with flammable gases. For your business to run efficiently, a competent commercial boiler system is necessary. Commercial boilers are available in different types that include gas-fired, oil-fired or a hybrid of the two. 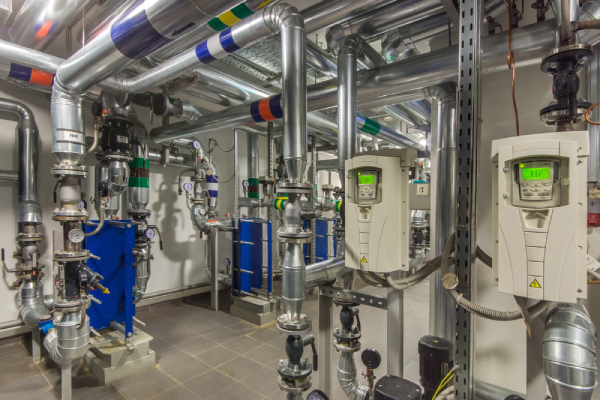 The type of boiler you choose for your commercial property will depend on some factors such as the size of the facility space you intend to heat or the lines you have running to the existing boiler. Improper installation of a new commercial boiler or an inaccurate specification in designing is some of the major causes of an inefficient boiler or in the worst case dangerous heating related disaster in the building or facility. Professional installation by certified and licensed contractors like McVehil Plumbing, Heating & Cooling will offer the best commercial boiler installation services in Washington, PA.
Once the installation process is complete, you will need to schedule regular maintenance with your plumbing contractors who will ensure that the boiler is always coded compliant and there is no risk of a dangerous system failure. Commercial boilers should be installed and maintained promptly so that the occupants of your building can be able to cope with the freezing winter weather. Most boiler failures are as a result of operator error, malfunctioning low water cutoffs, corrosion or poor maintenance. It is therefore essential to have professional plumbing contractors like McVehil Plumbing, Heating & Cooling perform regular boiler inspection, testing, and maintenance. This will reduce downtime caused by an interruption of services to the occupants of your building or facility. It will also enhance optimal energy efficiency and lower operating costs. When your business is booming and generating a lot of revenue, it is quite easy to take for granted the comfortable work environment and forget that your commercial boiler requires servicing and routine maintenance. Whether you are looking for boiler installation or maintenance services in your new or existing building in Washington, PA, and the surrounding areas, contact McVehil Plumbing, Heating & Cooling today. Our professional plumbing contractors will ensure that your building’s boiler is installed correctly and well taken care of. McVehil Plumbing, Heating & Cooling is a family run business which has been providing expert boiler installation and maintenance services for the last 100 years. Besides the installation and maintenance of commercial boilers, we also offer repair services. Get in touch with us today via our contact number 724-225-3500 and our contractors will ready to attend to you at any time of the day.